This is a very handy tool to have when you’re out hunting, because we don’t want to lose our animal. And every hunter makes one of his own. Seals can sink quickly when shot with a rifle, making them difficult to recover. 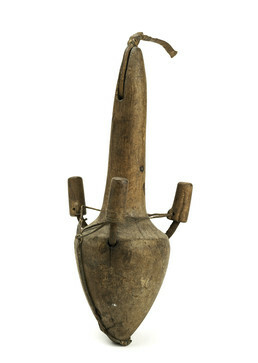 Contemporary hunters use this seal retriever or “sea dog” to hook the animals and pull them toward shore. Even in the days before guns became available, hooks on long throwing lines were occasionally needed to snag and retrieve the carcasses of sea mammals and birds. With traditional technology, however, the recovery of animals was helped by the fact that they were attached to floating gear such as seal darts, darts with bladders, or sealskin buoys. Vlass Shabolin: Okay, this is what we call qayux^ [retriever, “sea dog”] in our language, in Aleut. In English if we talk about it, we call it “sea dog.” You have a line on the end of it that’s 75 to 100 feet long. When you kill an animal in the water which is maybe 100 feet away from the shoreline, then you throw this out on the other side of the seal. The front end is big, because it will bob down that way and come in and grab the seal hide [when you pull the line in]. Then you retrieve the seal onto the beach. This is a very handy tool to have when you’re out hunting, because we don’t want to loose our animal. And every hunter makes one of his own. These were made with the driftwood, from a baseball bat nowadays. They’re carried on the outside of the packsack when they’re out hunting. So when they go to the rookeries on the cliffs there to hunt the seals, they take it out and check the line and make sure it’s not tangled. As soon as they shoot an animal then they grab it, and they run down to the rocks on the side of the cliff there and throw this qayux^ out and bring in the animal. Then two or three guys if they’re together there go ahead and start skinning the seals. Mary Bourdukofsky: They use if for bird hunting too when they drop in the water. Vlass Shabolin: This is the proper way [to keep it]. So as not to injure yourself, you cover the sharp end of the hooks. They put it in their packsacks so it won’t tie up on the rope. Daria Dirks: What do you cover it with? Vlass Shabolin: This one here’s got wood. This guy [who made it] knows what he is doing. For ours, if we have some foam, we put it over the hooks. 1. The comments in this section are from the discussion of a similar retriever E383192. Even in the days before guns were available, hooks on long throwing lines were occasionally needed to snag and retrieve the floating carcasses of sea mammals and birds. (1) With traditional technology, however, the recovery of animals was usually helped by the fact that they were attached to floating gear such as seal darts, darts with bladders, or sealskin buoys. With the use of rifles, the qayux^ [retriever, “sea dog”] became more important because sea mammals usually sink when shot. Quick work with the retriever will prevent their loss.